Come spend your Spring Break at Catalina Island to study the book of Mark with your friends and with other SoCal college students! 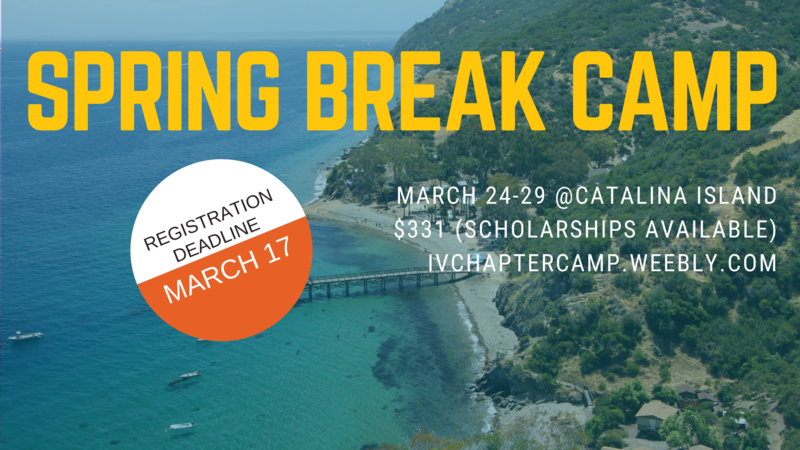 You are invited to return to or visit for the first time InterVarsity's camp on Catalina Island. Chapter Camp is an opportunity for you to get away with others from your InterVarsity fellowship, make new friends from chapters around the western US, and go in-depth with God through the book of Mark. Campus by the Sea is a beautiful location complete with opportunities for basketball, volleyball, snorkeling, sea kayaking, swimming, fishing, hiking, and exploring. This is one trip you won't want to miss! Don't let money to be an issue!